She was the Mackenzie of the 1980s, a surname that became huge for girls, with plenty of spelling derivations. 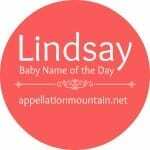 Thanks to Lindsey for suggesting her name as our Baby Name of the Day. Which came first, Lindsey or Lindsay? They actually peaked at about the same time. By 1984, Lindsey ranked #35 and Lindsay came in just one spot behind, at #36. Combined, about 17,500 girls received the name – meaning she hovered just outside of the US Top Ten, without counting Lyndsey, Lyndsay, Linsey, and Lynsey. Her origins are back in the fifth century, or maybe earlier. 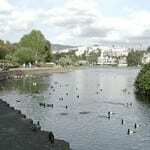 First came Lincoln – a place name derived from lindo – lake or pool, combined with the Latin colonium. Lincoln was a major city in a minor Anglo-Saxon kingdom. The kingdom was known as Lindesege – Lincoln plus eg -island. Lindsege eventually became Lindsey. Over time, Lindsey and Lindsay also stood in for a host of Gaelic surnames from other origins, especially Ó Loingsigh. It’s also possible that Lindsey evolved from an older Anglo-Saxon given name. What we know for certain is that Baldric de Lindsay lived in Norman England, and a steady drip of well-born and accomplished Lindsays followed, including a 13th century crusader. What accounts for Lindsey’s leap to the girls’ side? We often credit The Bionic Woman, but Lindsay Wagner, the actress who played Jaime Sommers in the 1970s was born in 1949 – the first year Lindsay appeared in the girls’ top 1000. In 1949, the #1 name for girls in the US was Linda. The -lyn/-lin sound was wildly popular. Carolyn, Marilyn, Evelyn, Lynn, and Lynda were all in the Top 100. Lindsay squeaked into the ranking with rarities like Roselyn and Sherilyn, and may have been helped by the sound of Top Ten pick Nancy. She didn’t last – Lindsay was headed back for obscurity pretty quickly. In 1973, a young Lindsay Wagner co-starred in The Paper Chase. In 1974, both Lindsey and Lindsay entered the US Top 1000. Then Wagner became The Bionic Woman from 1976 to 1978, winning an Emmy, and the name skyrocketed. By 1978, Lindsay was in the Top 100, and Lindsey joined her two years later. The names joined a list of 80s favorites with a surname-y, borrowed-from-the-boys vibe: Ashley, Courtney, Leslie, Brittany, Kimberly, Whitney. So dominant was she that men named Lindsey are almost extinct – only six boys received either spelling in 2011, though names like Lincoln and Linden are in use. While many Lindseys are now likely to be naming babies of their own, the names have not disappeared entirely – Lindsey ranked #460 and Lindsay #653 in 2011. She still sounds like many popular, gender neutral names, and we continue to embrace -lyn appellations like Katelyn and Brooklyn. Today she’s fading, and yet it is still easy to see why parents once embraced this attractive, active name for daughters. Had she not been such a smash in the 80s, doubtless she’d be a fast favorite today. Just thought i’d point out that I am male and my name is Linsey. Born in 92. I was named after Lindsay Buckingham. I think the dominance of the name Linsey as a girl name is particularly prevalent in the US. 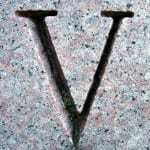 The name seems to be more common for males in countries like Scotland – which is where my family comes from. I think it’s a great name for a guy. My daughter is Lindsey, born 1989. I thought it would be unique. Little did I know there would be 3 Lindsey’s in her homeroom at one point and her best friend is Lindsay. It was very common in the 90’s. I think it sounds girly and happy. I just asked my mother and, like me, she doesn’t know anyone with this name. When I hear it, all I can think of is the [male] character Lindsey McDonald from the show Angel, played by Christian Kane. No surprise here, I only like it for a boy/man. I was born in 1978 and my mom named me after the actress Lindsay Greenbush, who starred with her twin sister Sidney in the TV show “The Little House on the Prairie” at that time. Oh, I loved seeing the girls’ names in the credits for the show! Congratulations on writing this post without mention La Lohan! I grew up with a family with the surname Lindsay, so that is the “correct” spelling to me. I’ll mention another variation: Lindy. I had a lovely classmate at Baylor with that name; never asked if it was short for Linda or something else. Ooh, yay, you did my name! I’m a little surprised to hear with spellings combined Lindsay hovered around the top ten in the 80s. I was born in 85 and while it’s not unusual for me to meet someone with my name it certainly doesn’t happen all that often. There was another Lyndsay at my elementary school whose mother was furious with my mother for using the same spelling she had used, her daughter was supposed to be special. My mom spelled it with a Y because that’s how she thought it was supposed to spelled, since Lynn is spelled that way. I’m biased obviously but Lyndsay is definitely my favorite spelling, I think it looks the most feminine and soft. With an i is ok, but I really don’t like the e for girls. For a long time I hated my name and thought it was only good for boys, but I’ve come to like it now. I don’t really know why. I’m not sure it fits me, if I’m being objective. I’d have been better suited to a vintage or classic name probably. I’ll never understand why my parents picked it either, the other favorites were Elizabeth, Rose, Grace, etc. My cousin born 6 months before me is Britney, which might account for it a little bit. Hmm, anyway, I’d be shocked to meet a baby Lindsay but kind of excited too! This was one of my favorite names when I was younger. The Lindsey spelling makes more sense phonetically but I think the Lindsay spelling looks better in print. I went to high school with plenty of Lindsays. It seemed like all the popular girls were named either Jennifer, Lindsay, or Danielle. The Lyndsey spelling used to be a guilty pleasure of mine. Lindsa/ey is rather sunny feeling, isn’t it? I know three off various spellings: Two are Lindsays, one girl(45), one boy (32). The boy Lindsay is married to a girl Tracey. It’s fun playing their names in a game: which one’s the boy? (or girl?)! One girl is actually Lindsee, and she’s just turned 21. I like the feeling of the name but it’s a bit dated to me as well so, I’d not consider Lindsa/ey. Might name a parrot Lindsay (my favorite of all the spellings) some day though. I think if I was a parent in the 80’s, I might have been one of Lindsay’s biggest fans. It’s hard to look at a name you were surrounded by with fresh eyes, but objectively it’s got a great sound to it. Man, I wish this ‘lyn’ thing in girls names would just die already! Soooooo played out. I was born in ’86, but I don’t think I’ve known any Lindsays! I must have, I just can’t remember right now. I’d never been fond of the name… it’s very close to linseed for me. My first and best friend is a Lindsay. As such, the -ey spelling has always looked off to me. I love her name. It is ’80s (as is mine), but it’s sunlit and happy. I’d be thrilled to meet a newborn Lindsay!